Remember the Rule of Thumb: Come see us BEFORE your prescription expires. Q: I would like to have a copy of my prescription for my own records. How can I obtain a copy? Answer: There are several options for obtaining a copy of your prescription. Option 1: The easiest and fastest way is to log in to your patient portal. Under ‘orders’ you can access your active prescriptions. Option 2: Come see our smiling faces! Stop in to have us print a copy for you anytime. Option 3: This option is ideal for patients requesting more than one prescription or wanting us to transfer records to another eye care provider. You can fill out the Authorization Release form and send a signed copy to us via email or fax. Q: Why can’t I get my next year’s contact order filled while there is still a month left on my prescription? Answer: Contact lens prescriptions are only valid for one year. Having a single month left allows for only that month to be filled. This is the perfect time to use the Rule of Thumb. Contact lenses are a medical device and are therefore governed by Illinois State Law. Contact lenses cannot be dispensed without a valid contact lens prescription. A contact lens prescription cannot be written for a patient under Illinois Law until the doctor has completed the initial fitting and confirmed the prescription at the appropriate follow up visit. For more information, the Illinois legislation can be found here. Q: If I just want a new pair of glasses with my current prescription, why can’t the optician just read that off my glasses and make me a new pair? Answer: We aren’t allowed to do that by Illinois State Law, plus the prescription on your current glasses may not be up to date. Therefore an optician is not allowed to “read” someone’s prescription off of their current glasses and make new glasses from this reading. Doing so would constitute practicing optometry or medicine without a license and they would be subject to severe penalties. Q: I’m thinking about ordering my glasses online, what do I need? Short Answer: You need a current prescription from our office as stated above. However, we cannot guarantee the accuracy and safety of the lenses or the frame fit or quality. Mileage may vary as the saying goes, but when the Journal of the American Optometric Association decided to road-test the most visited internet glasses providers, their results were disheartening: nearly half of the glasses ordered failed at least one parameter of optical or impact testing. 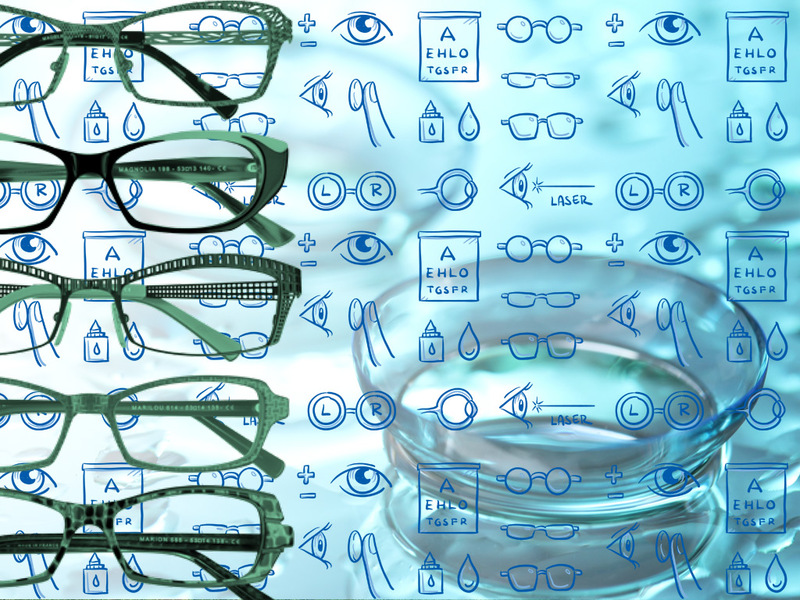 Other failures included incorrect prescriptions and added or omitted lens treatments.The JAOA has an ongoing public awareness campaign for consumers on the details and potential pitfalls of purchasing glasses online. For more information, visit the JAOA here. Q: HELP! I bought my glasses elsewhere. For verifying lens accuracy or checking your prescription, an office visit with a doctor is required. Fees start at $40. For fit, we will very carefully try to adjust your frames but we are not responsible if a satisfactory fit cannot be achieved, or if the frames are damaged. Replacement of frames or lenses are the patient’s responsibility. Q: If I only need glasses for reading, can I still wear contacts? Answer: Yes, there are contacts made for people who do not need a distance prescription but are having difficulty with near work. You still need to have an eye exam and a contact lens evaluation. If you have never worn contacts before, you will also have to schedule a contact lens insertion, removal, and care session so we can teach you how to properly care for your contacts. Q: Can I lose my contact behind my eye? Answer: No. The white part of the eye and the inside of your eyelid become one tissue just below the brow line, and just above the cheekbone. The lens cannot go any further back than that. If you lose a contact in the top part of your eye, do not panic. Put a couple of drops in your eye, close your eye, look down and gently massage down from the brow area. This should move the contact down to where you can find it. If you still cannot find the lens, please come in to see us. Do not keep digging at your eye. Many people scratch their corneas by digging excessively trying to find a lost lens. Q: Can I sleep with my contacts in? Answer: Sometimes. We do not recommend sleeping overnight in your contacts. Some lenses are approved by the FDA for 7 day or 30 day continuous wear. But even with these approved lenses, you are 7 times more likely to develop a severe vision-threatening condition (most frequently a corneal ulcer) than if you wear lenses only during the day. For a patient who insists on sleeping in their lenses, we prefer “flex wear”. This means primarily taking out the lenses every night, but knowing that you are wearing approved lenses and can, on special occasions, (we all know what those could be) leave them in overnight. If you do sleep in your lenses, the doctor will most likely recommend more frequent office visits to monitor your eye health. Also, if you sleep in your lenses, any symptoms of pain, redness, blurred vision, discomfort even after removing the lenses, extreme sensitivity to the light or anything other sudden changes in your eyes should be considered an emergency. Q: Can I swim in my contacts? Answer: No. You should not swim in your contacts. There are organisms in water, both fresh and seawater that can eat through an intact cornea in 24 hours. The chemicals in treated pool water can also soak into your contacts and cause corneal swelling or a chemical corneal abrasion. There is good news for patients who want to be able to see at the pool or beach. Your risk of serious infection or chemical reaction diminishes greatly with single use lenses. Even if you wear standard disposable lenses, ask your doctor if you could be fit with a small supply of supplemental single use lenses. These single use lenses are also available for patients who wear astigmatism contacts. NOTICE: All eyewear at Visionary Eye Care are considered medical devices and as such are regulated by Illinois State Law.